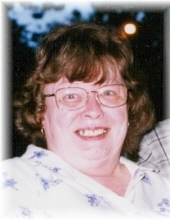 Kay Miers, age 79, of Clarinda, Iowa entered into peace Thursday, January 31, 2019 at her residence in Clarinda. Memorial Celebration of Life Services will be held at a later date. Memorials may be given in her name. Memories and condolences may be shared with the family on our website at, www.ritchiefuneralhome.com under Obituaries. Arrangements were entrusted to the Ritchie Funeral Home of Clarinda, Iowa, where we ‘Celebrate Life’. Kay Ellen (Russell) Miers was born August 5, 1939, in Sheridan, Missouri the daughter of Thurman (Tug) Elmer Russell and Mary Jane (Smith) Russell. “Tug” was operating a portable mill in the area at that time. Mary Jane became ill when Kay was very young, and the family moved to Clarinda to live with Tug’s parents, Blanche and Elmer Russell, where Mary Jane passed away from Hodgkin’s disease in 1942 when Kay Ellen was just 3 years old. Kay Ellen had a home with her grandparents from that day on---going to grade school at Lincoln School, just kitty corner across the street from where she lived, while her dad joined the Merchant Marines to help the war effort. When he returned home from duty he lived and worked in Shenandoah, so she continued to live with her grandparents as before. Her dad married Audrey Jeanne Shields of Council Bluffs and they moved to Clarinda in 1948. Kay Ellen continued her education in Clarinda, graduating from CHS with the class of 1957. After graduation, she married Donald R Rucker from Clarinda and they moved to California where Don had been transferred to Fort Ord from Fort Riley, Kansas. To this union was born two sons, Michael Ray in 1958 and David Alan in 1960. After discharge from the army they lived for a brief time in Englewood, Colorado and then went back to San Jose, California. They divorced in 1967, and then Kay and the boys moved to Winterset, Iowa with her parents until she met and married Robert M. Baker of Eagle Grove, Iowa who was working in Clarinda, so she and the boys moved to Clarinda where she has stayed. She began college classes in 1969 at Iowa Western Community College in Clarinda and graduated in 1972 from Northwest Missouri State University with a teacher’s certificate in Vocational Home Economics. She did not get the opportunity to teach full time, but worked in dietetics at Westridge Nursing Home, which was West Heights Manor at that time. She then worked for Hemmen Home Center designing kitchens, then worked for the Municipal Hospital, now CRHC, in patient accounting. In 2008, she married her Junior High School “boyfriend”, Marvin Miers. and the couple shared many happy years together. Left to cherish Kay’s memory is her husband Marvin Miers of Clarinda, Iowa; her two sons, Mike Baker and wife Candice of Eagle Grove, Iowa, and David Baker and wife Kimber of Silverado, California; many grandchildren and great-grandchildren; along with many other family members and friends. Preceding Kay in death are her parents, Thurman and Mary Russell; her step-mother, Audra Jeanne; and a brother, Greg Russell. "Email Address" would like to share the life celebration of Kay Ellen Miers. Click on the "link" to go to share a favorite memory or leave a condolence message for the family.